A Tornado Hit My House – Literally! Call me – Emergency! was the text my neighbor sent to me last week while I was visiting Orlando for my daughter’s dance competition. Oh My Word, the thoughts that filled my head… What is wrong with my kids, did someone get seriously injured, is my neighbor hurt? I felt out of control and scared! Have you ever felt like this? I was not home to help or in control of the situation and I was feeling desperate! You can imagine the fear that overcame me. I knew my family was scheduled to eat dinner at my parents house that night so they were not home and I was relieved. Then, I thought about my dog, Sam (he IS my 6th child). I thankfully found out after 15 minutes, that he was safe and just a little shaken up. My kids begged Jeremy after dinner to go home and jump on the trampoline with my nephew who was visiting from AR. Thankfully they did not go. 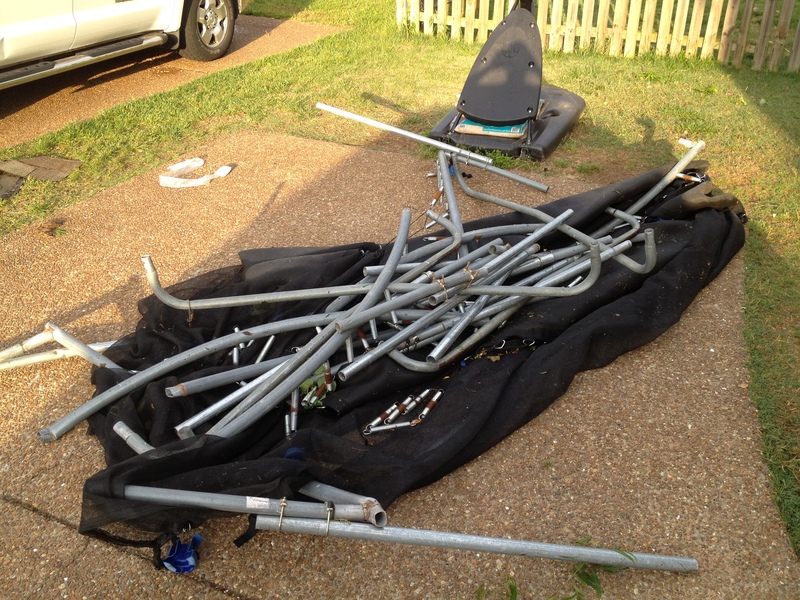 This is what the tornado did to the trampoline! Our trampoline was literally picked up and flew 200 feet in the opposite direction as the playset – some of the poles are still on the roof of a house 2 doors down. Our large wooden play set flew in the other direction and slammed into our fence which now has an entire section missing from it and our roof is damaged and will have to be replaced. The good news….. NO ONE WAS HURT! God is watching over your family every minute of every day. Even when you are not present, His hand of protection is all over them even when the tornados in life (literally sometimes!) appear out of nowhere! Put your trust in HIM! ← Can you spare a minute… or 10?